The all-white facade is made up of 15,000 crackle-glazed, three-dimensional tiles that catch the Iberian light. A view of the entrance from the river’s edge. The sloping rooftop rises 12.4 metres and is a destination in its own right. The Oval Gallery, the main exhibition space, will house installations by visual artists, architects and new media artists. When it is finally complete in March, the Museum of Art, Architecture and Technology in Lisbon will include a park by Lebanese landscape architect Vladimir Djurovic as well as a restaurant and shop. Even on a clear day, cruising along Lisbon’s Tagus River, it would be easy to miss the Museum of Art, Architecture and Technology. 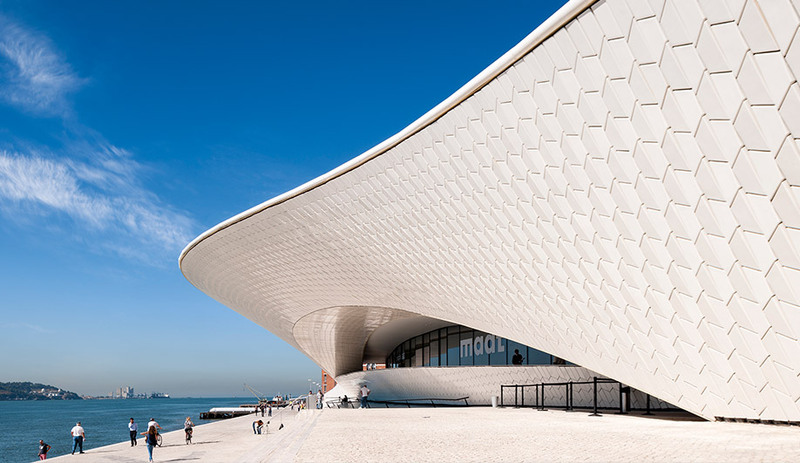 With the same humpbacked profile as a stingray, the sleek museum, known simply as MAAT, spreads out along a generous boardwalk. Covered in three-dimensional ceramic tiles that soak up the Iberian light, the low-lying form changes appearance from minute to minute like a chameleon. Whether approached by land or water, the structure is both ominous and sublime. Already wildly popular with locals, MAAT is fated to become a major tourist destination in a city that attracts nearly seven million visitors annually. 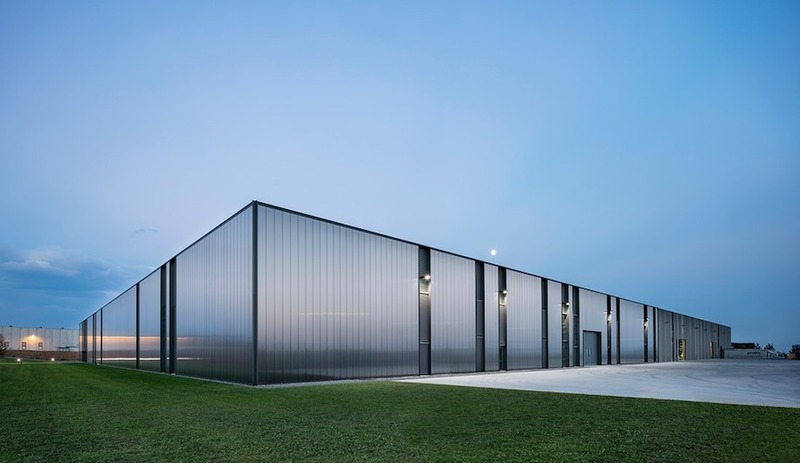 It is also a significant project for the firm that designed it: AL_A of London, headed by Amanda Levete. Since launching in 2009, the studio has built up an impressive C.V. that runs the gamut, from mega-projects that have taken years to complete, to ultra-modest endeavours. The Central Embassy in Bangkok, for instance, is a shopping complex opened in 2014 that will have a 36-storey hotel attached to it later this year. By contrast, a few years ago, just for fun, Levete and her team designed a pop-up restaurant called Tincan that featured nothing but canned seafood. 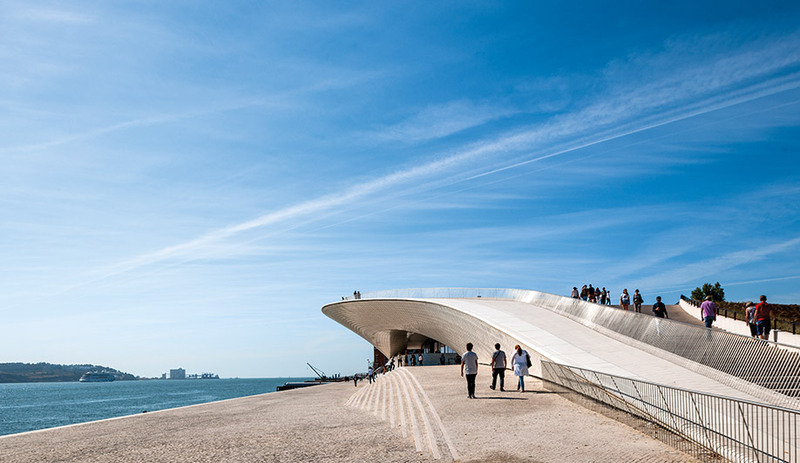 An expansive boulevard along the Tagus River leads to the MAAT’s crescent-shaped entrance. Levete’s design allows people to walk in, through and on top of the building. 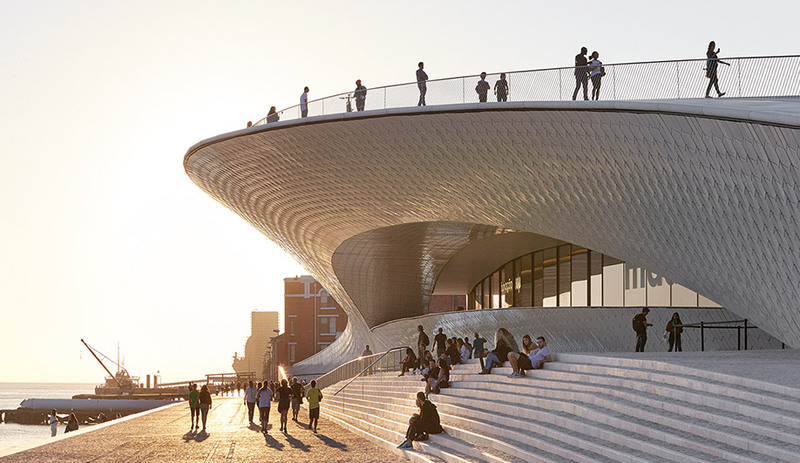 Beyond its swooping profile, the Lisbon project stands out for its visionary ambition. Labelled a kunsthalle, MAAT will dedicate ample space to site-specific installations in disciplines ranging from architecture to science to new media. 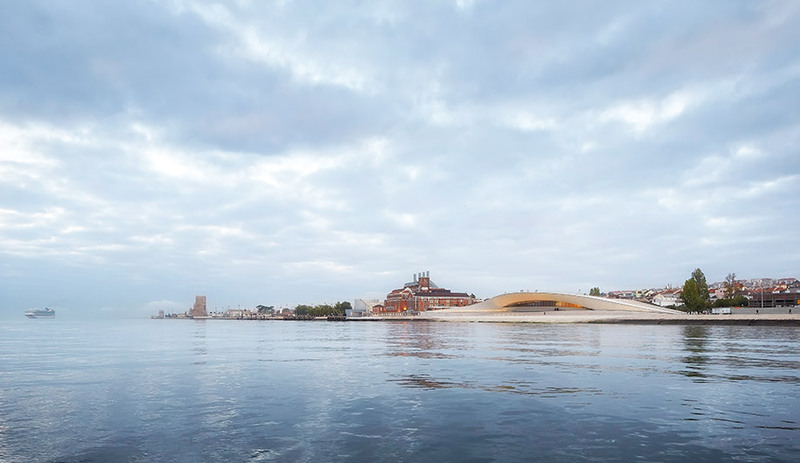 Opening in March, phase two includes a park by Vladimir Djurovic Landscape Architecture and an elegant pedestrian bridge, by AL_A, that lands on the museum’s roof, uniting the building and the waterfront with the city. It’s hard to disagree with the metaphor. It’s also an effective way to describe the grander story of Levete in charge of a 50-person team. Too big to be a family, but small enough for her to know everyone by name. 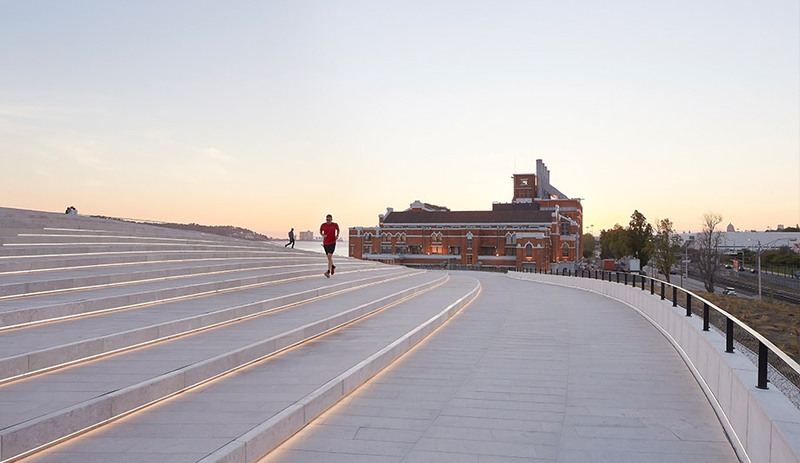 The goal was to create something totally different: a building that attracts tourists and reconnects the city to the river. 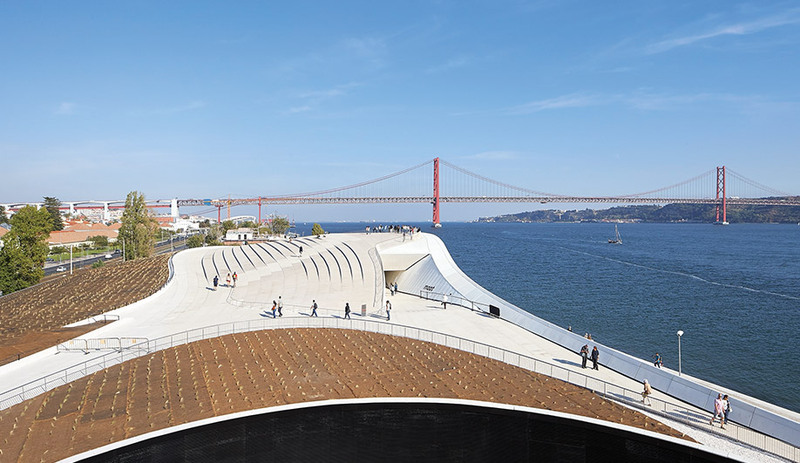 The commission to design MAAT came in 2011, directly from António Mexia, chief executive officer of Portuguese energy giant EDP (whose philanthropic EDP Foundation owns the museum). Mexia and Levete collaborated on both the architecture and the concept. Physically, the 7,400-square-metre building is intended to be a vital link between the city and the water. Like many port cities, Lisbon ignored its coastal connections for decades. But it has recently begun to see the waterfront’s cultural and economic potential and added such people-friendly touches as bike paths and bridges. The MAAT’s roof, which rises 12.4 metres at its highest point and doubles as a piazza, is a destination in its own right. A stepped grade leads to an idyllic lookout, with the water in one direction and the city in the other. 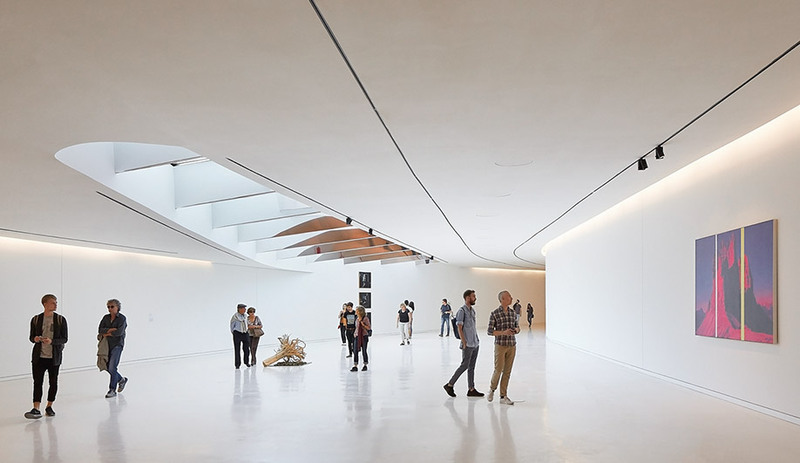 The subterranean galleries are characteristically all-white, from floor to ceiling. “Reconciling the degree of separation [between water and land] became the most important driver,” Levete says. “It’s what shapes the building. 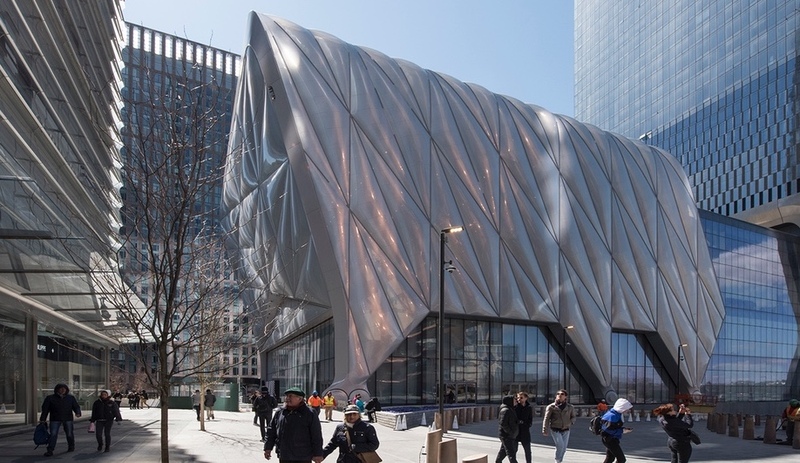 It was very counterintuitive to put the galleries below the water table.” Yet, when one enters the interior, the river-city connection is almost lost. 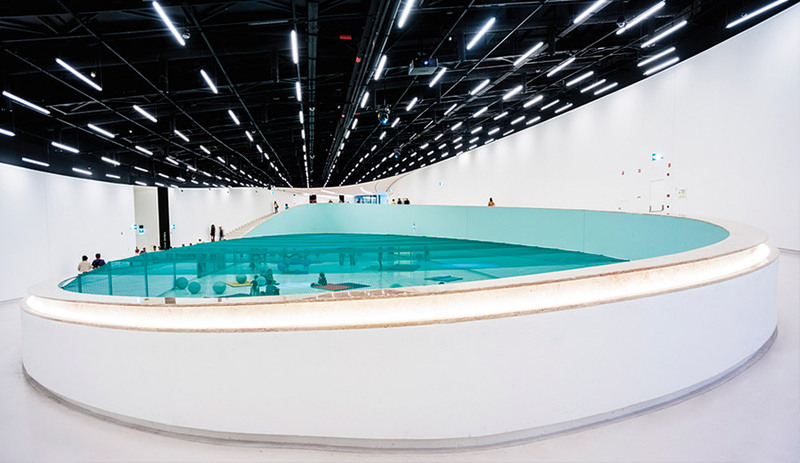 Visitors are led down a ramp that loops around the central exhibition space and into a series of subterranean rooms that have a uniform look of polished white floors and curving walls. 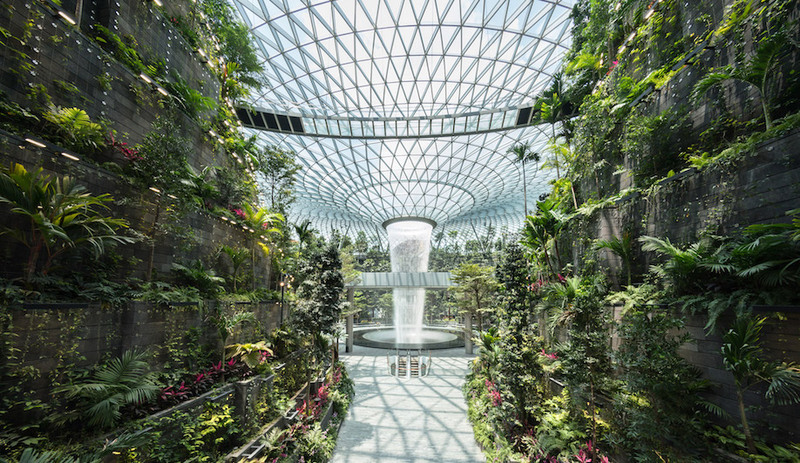 Natural light, which is integral to the exterior’s appearance, is channelled into only one of the galleries through a single skylight. The space feels like a world of its own. The effect isn’t disappointing, though. Without much contact with the outside, attention is focused on the art. Visitors enter the elliptical central gallery via a ramp. Standing in the space is an experience in itself, and it will no doubt be a challenge for artists to negotiate the gallery’s scale and oval form. For the inaugural exhibit, French artist Dominique Gonzalez-Foerster suspended green mesh across the entire 1,000-square-metre expanse and scattered exercise balls and rectangular mats across the floor. The installation, titled Pynchon Park, is described ominously as “an enclosure where aliens would be able to observe human behaviour in optimal conditions.” Inside the gym-like space, most visitors were comfortable taking a break, resting alone or in small groups across the mats. The rooftop doubles as a piazza at the water’s edge. 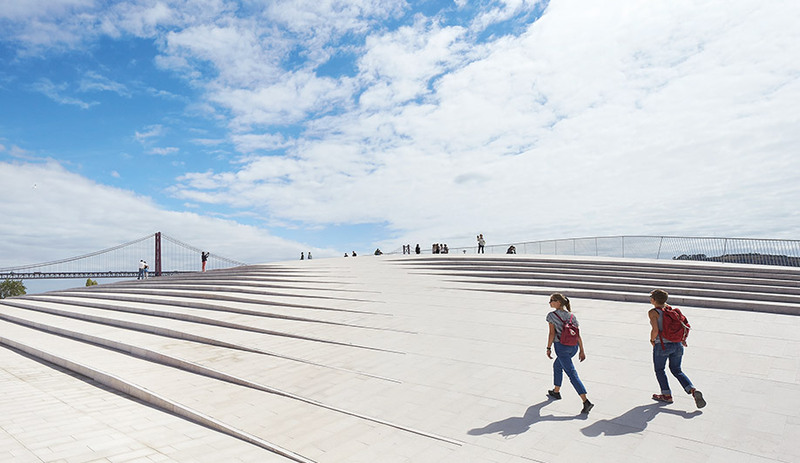 The people of Lisbon are already chuffed with their new cultural hub; its curved rooftop is continually occupied with strollers, joggers and dog-walkers alike. If success can be measured in Instagram posts, then Levete’s Portuguese clients must be very happy. Yet Levete is slightly wary of her building’s hashtag popularity. “I think the consequence is that it makes us more superficial,” she says. “One-liners take on greater importance above any deeper examination. 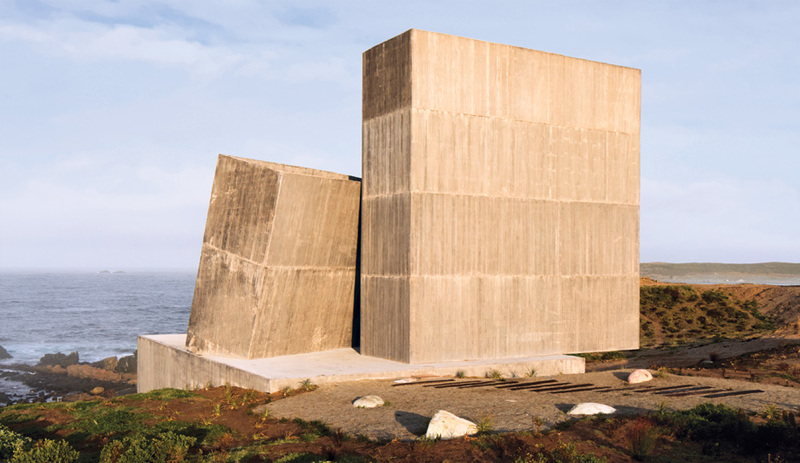 It’s a problem, where you can’t actually see the work behind it.” Levete’s main objective might have been to reawaken a neglected shoreline; what she ended up making in the process is a building that suits our image culture to a tee.